One Ubuntu 18.04 server set up by following the Ubuntu 18.04 Initial Server Setup guide, including a sudo non-root user and a firewall. Ansible and Molecule configured, which you can do by following Step 1 of How To Test Ansible Roles with Molecule on Ubuntu 18.04. Git installed by following How To Contribute to Open Source: Getting Started with Git. Familiarity with continuous integration and its use cases. To learn more, review An Introduction to Continuous Integration, Delivery, and Deployment. An account on Travis CI. Ensures latest index.html is present: This task copies over a template templates/index.html.j2 that Apache will use as the web server’s home page. ubuntu18 is the second platform and uses the solita/ubuntu-systemd image. In addition to using privileged mode and mounting the required kernel modules, you’re running /sbin/init on launch to make sure iptables is up and running. Then, in the same file, you’ll add test_pkg() test. Note: When adding multiple tests to a Molecule test file, make sure there are two blank lines between each test or you’ll get a syntax error from Molecule. Next you’ll create the test_RedHat.py test file, which will contain tests specific to Red Hat distributions to target your CentOS platform. Now that you’ve completed writing tests in all three files, test_common.py, test_Debian.py, and test_RedHat.py, your role is ready for testing. In the next step, you will use Molecule to run these tests against your newly configured role. You’ll see Verifier completed successfully in your output; this means that the verifier executed all of your tests and returned them successfully. Now that you’ve successfully completed the development of your role, you can commit your changes to Git and set up Travis CI for continuous testing. If you go to your fork’s repository at github.com/username/ansible-apache, you’ll see a new commit called Configured Molecule reflecting the changes you made in the files. In this step, you’re going to integrate Travis CI into your workflow. Once enabled, any changes you push to your fork will trigger a Travis CI build. The purpose of this is to ensure Travis CI always runs molecule test whenever contributors make changes. If any breaking changes are made, Travis will declare the build status as such. python: Here, you’re specifying that Travis will use both Python 2.7 and Python 3.6 to run your tests. services: You need Docker to run tests in Molecule. You’re specifying that Travis should ensure Docker is present in your CI environment. install: Here, you’re specifying preliminary installation steps that Travis CI will carry out in your virtualenv. Once you’ve added the content to the Travis CI configuration file, save and exit .travis.yml. 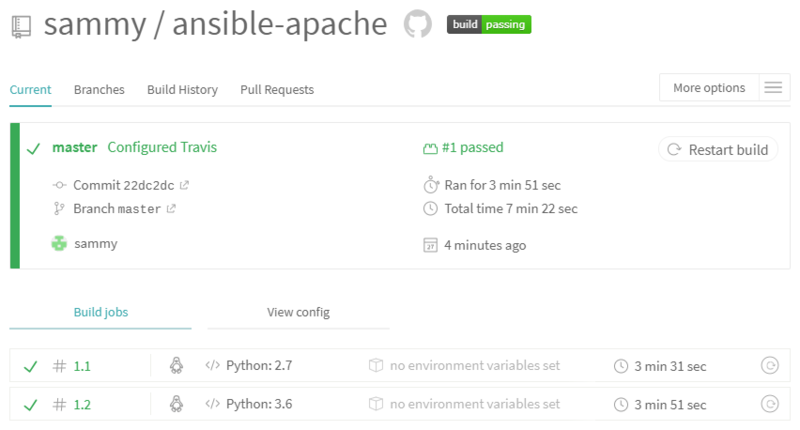 Now that you’ve successfully set up Travis CI for your new role, you can continuously test and integrate changes to your Ansible roles. 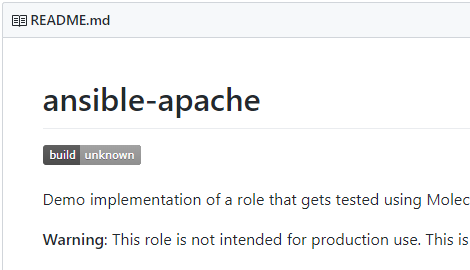 Once you’re comfortable with the creation of roles and testing them with Molecule, you can integrate this with Ansible Galaxy so that roles are automatically pushed once the build is successful.